We went on tour with the Association of “Libera Università Tito Marrone” of Trapani, which the Presidenti is Antonio Tobia, in Caltabellotta, a little town placed between sky and earth, we were surprised to find out “Giotto”. A kind of contemporary “Giotto”, not a painter but a sculptor: SALVATORE RIZZUTI. The meeting point was the Civic Museum, where the artist gave 33 pieces of art as donation for the town, then he started to introduce them and explainig their natural essence to us and telling also his straordinary life. He was born in Caltabellotta (Ag) the 28 June 1949, at the age of 9 years old his father retired him from the school, interrupted the fourth grade and takes with him and the other two brothers to help the family with their sheep-farming company. So he was a sheperd until the age of 18 years old, he grow up with a deeper soul that only people in contact with nature and animals can have. “I wasn’t disturbed by people” he said, “ and i had so much time for meditation”. So imagine as all the magic sourrandings of nature effected him. All the materials he founded around were sculptures for him: stones, wood, clay. Salvatore gifted the small sculptures to his friends, who faced his father to understand that Salvatore was an artist and he needed to go on with the studies to improve his tecniques. At that moment Salvatore started again and finished the school. In 1967 he went in Palermo to complete the Artstic High School and in 1972 he attended The Academy of Beauty Arts under the supervision of the teachers Silvestro Cuffaro and Carnelo Cappello, so finally he became a real sculptor. In 1980 he got a chair for teaching Sculpture Tecniques at the Academy of beauty Arts in Palermo until 2015. In this years he realized many different masterpieces both secular and religious. We had the previlegius of admire his sculptures at the Caltabellotta’s Civic Museum, the most important was “TRIBUTE TO PIERO”. The tribute was made for Piero della Francesca, work made of clay that represents two different shapes 171 cm tall, which the precision of the shapes is the result of the right balance between mathematical and geometric relations: the mathematical base of the beauty. The original “ SICILIAN VESPRO”: it’s an huge sculptorer group. 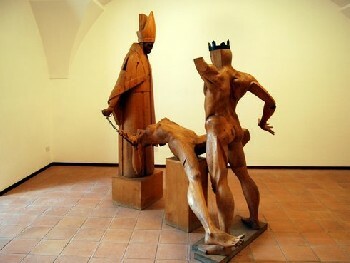 It’s made with 3 figures: the Pope Urbano IV (the Church), with a treacherous and ugly face turned on the opposite side of his hand who is holding a chain tighted to a woman (The Sicily), meanwhile she is being raped from a figure with a crown ( Carlo d’Angiò). This masterpiece shouts to the visitor all the angioin violence of that period in Sicily that was authorized from the Church. “THE MERMAIDS SINGING”: It’s a big group made with clay, where the mermaids represents our soul’s voices, that is imprisoned in a body distracted from other’s words. By the way in that moment the soul goes in meditation ( so hereby the sheperd comes out), he can feel his own soul. Between minus importan works, it strikes “DEDALO’S CONSCIENCE”. Here Dedalo has already built his work: the labyrinth. But in the moment he has finished the job, he was horrified from what he was made: the Minotaurus lying on his feet, but it’s motionless and really smaller than the huge Dedalo’s figure, who while shivering, realizes that he made a prisoner that looks monstrous but just for its look and in reality it was harmless. “IMPOSSIBLE TO FLY”: it’s a small stuatue made with clay (88 cm). It represents a young woman having the wings thighted to an iron chain, that she would like to break with some scissors for paper. This sculpture has got such a nice refinement beauy and it transmits all the women’s impotence of the willing to be free from the man’s submission. Women try to free their souls, but their available tools aren’t adapted to do it. The Teacher, talking about his works, discloses his soul. A soul who lived on a fairy dimension as his birhplace, a soul that has founded it’s roots on the earth in order to elevate itself towards the sky. A simpleman’s soul full of light because it’s still in contact with the nature of the things, animals and people. All these things gave us a lot of emotions, we, city’s animals, used to live in the middle of the caotic urban traffic, where sometimes we can still discern pieces of sky.